KUALA LUMPUR 19 Dec 2013 – A shocking 92 % of patients with both diabetes and hypertension are still unable to maintain satisfactory health, even when they are supplied with quality medication. 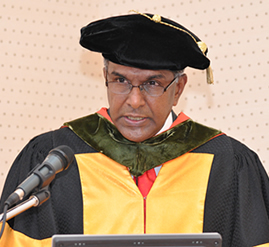 The figure was presented by Prof Paraidathathu Thomas I.P.G Thomas as part of his Inaugural lecture. The lecture was held here at The National University of Malaysia (UKM) Kuala Lumpur Campus. Prof Paraidathathu who is also a professor with the Faculty of Pharmacy UKM said, the reason for this is patients failed to take their medication properly. In other words they are medically non compliant. They either don’t take their medication at all or forgot to take their medication regularly. Patients with both diabetes and hypertension have an exceptionally high risked of complications like stroke. They are at greater risk than patients with only Diabetes or Hypertension. But it seems these are the people who are the least compliant even when their risk is greater. As for patients with Diabetes but do not have hypertension, only 41 percent were compliant to treatment required to put their condition under control. However, patients with hypertension were a little bit more compliant than diabetic where 53.4 % actually take their medication as prescribed. This is a shame considering diabetic and people with blood pressure enjoy high quality medication and free. According to the research in 2007 the public healthcare spent RM 84,415,000 on diabetes medication. As for Hypertension medication RM 113,078,000 was spent. The lack of compliance from patients, has undermined the efforts that to give them the best treatment possible. As for medical practitioners they are not entirely blameless. A shocking 80% of medical practitioners prescribed antibiotics for patients with flu. Antibiotics, has no effect on flu which is caused by virus, and prescribing antibiotics for flu patients may actually make things worse. The use of antibiotics in these cases may actually develop microbes that will be immune to antibiotics. So this is actually putting the immune system at risked. Prof Thomas was one of the pioneers of the Pharmacy Faculty in UKM. He received countless awards for his contribution to the development of the country in terms of steering the nation’s health. But the award that is most revered and cherished by him is ‘The coolest lecturer’ award given to him by his students. Present at the lecture was the Vice Chancellor of UKM Prof Tan Sri Dato’ Seri Dr Sharifah Hapsah Syed Hasan Shahabudin, Deans of faculties, lecturers students.